In the video, “I am Tyler”, a video about a cerebral palsy young man, my first emotion was sympathy, which lasted less than ten seconds! If Tyler was sitting in front of me, I am positive he would loudly proclaim, “Do not pity me”. And I would not. My daughter, Shaynan, and I attended a wedding a couple of years ago, and there was a local couple with their daughter who was in a wheelchair and non-verbal. Her parents took her out on the dance floor every time the disc jockey played a dance with a peppy step, and spun her around and danced with her. She even had a place in line when the bride threw the bouquet! She did not catch it, but she did not leave empty handed, as my daughter gave her the bridesmaid flowers she herself had for the evening! A smile is worth a thousand words and she just beamed! Do I treat people differently if they are different? No, my mother taught me that those who are different could be in your family, and you need to help others every chance you get. And I have a maternal cousin who is mentally challenged and a cousin who has a daughter that has a severe form of cerebral palsy and is non-verbal. I do not treat people differently, but if they need help, I step up and help in any way I can. It pulls at my heartstrings because while I do not know personally what they are going through, I can imagine what they are experiencing, and may only be ten percent correct. Direct Mailing? Why Should We Not Try A Couple Of Mailings? According to an article on the website www.thebalance.com, direct mailing is defined as a form of direct mailing in which letters, postcards, or other marketing material is sent to past, current and future customers in the hopes of obtaining their business. In many of these cases, the mailing is to a specific, identified, target audience. The audience includes consumers, as well as other businesses. Bulk mailings are cost effective in that they are less in the per-piece cost versus the United States Postal Service mailing costs. Expensive if no response in the form of a purchase is made. What might be mailed out to the targeted market? Those items include discounts and specials, useful items (calendars) or tips, reminders (a tax preparer may send out the upcoming tax year tax credits), samples and announcements. Another form of direct mailing may be a newsletter announcing the upcoming events in a business and may include discounts and coupons for services. Decide your goal of what the receiver will do once they receive the mailing. Determine what type of mailing will be mailed out. Create your mailing by writing directly what your goal is. Have your mailing professionally designed and printed in order to get the customers in your door. Identify your target market audience for your mailing campaign. Contact your local post office about using bulk mailing, which is the most inexpensive way of mailing a direct mailing. Do a test run of your mailing by sending to a select number of your target customers in order to evaluate the message that is being mailed? If you receive the response you would like, send to the remainder of the target customers. Prepare your mailing and take it to the local post office. Track responses to evaluate if direct mailing is effective in reaching your market. Are we done now? No, to be effective, you need to hit a customer more than once with your direct mailing campaign. And what better way is to start planning the day after you get a mailing done! In using this information, I feel that the cost involved is worth a mailing to several target markets for Kent’s Camera Castle. The primary group would involve the professional photographers and the secondary group would entertain the photography buffs who want to enter the professional market. What would be my message? 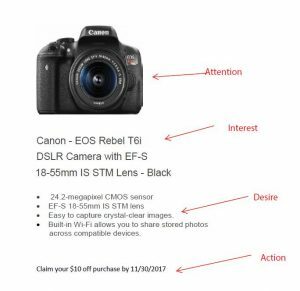 A camera, information to gain interest and a possible discount to get the customer in the door. While the project would prefer to not utilize a discount, I feel a small one would gather enough interest to get the target audience in the door. A picture is worth a thousand words and this sample would garner interest. And once in the door, what else might they purchase? The misconception I had about this assignment was that for such a small budget, a direct mailer would inspire 60% of the recipients to take action. As this is over 50%, it would be worth looking into. And according to huffington post, 41% of those over the age of 65 do not use the internet and they would benefit from the direct mailer. 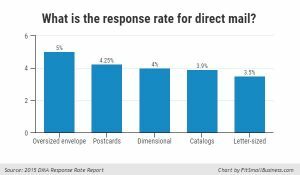 “Direct Mail Defined”, http://www.thebalance.com/direct-mail-defined-1794410, Retrieved 11/2/2017. Reflection on Our Marketing Career Preparation Website Premier Night! Tonight, our Marketing Career Preparation class premiered our own websites, plus our instructor, Jennifer Nettell, allowed us a glance of hers. In some ways, it was a learning experience for those of us who have not previously created a blog or our own website. For me, it was a learning experience, but one that I embraced. I am open to learning new things and while it was a challenge in the beginning, it was fun after I was able to connect the dots. In the viewing of other websites, I enjoyed the ones that had a lot of personal information and the creativity and talent in construction of the websites. In looking at my own website, I feel that I need to add more photos, and add a number of my favorite quotes. It was suggested that we add a page of our favorite links, and I feel I should add a page of the books that I have found helpful, both on life and emotional health. When I attended Western Technical College in the late 1990’s, I was enrolled in a Friday morning class similar to this one, where we created a map of where we came from and where we wanted to eventually be with our life and career. We did not have a website of our own that included our blogs, pictures, quotes and reflections. We did have a form that we filled in with our dreams, and who we wanted to be when we grew up, or where we wanted to go at that particular stage in our life. I remember thinking at the time that life is what you make of it, you bloom where you are, and each situation you are in is a learning opportunity, to strengthen you or to help you become the person you should be. In this class, we are learning to better ourselves, to give us confidence and utilize those tools that are available to us to better obtain the goals we have set for ourselves. In returning to school, I hope to have the employment that will fulfill my needs in this stage of my life. A banner ad or banner advertising in a rectangular graphic display that stretches across the top or bottom, or along the side of a website. Or more simply put, online advertising via banners, and their intent is to generate traffic to a particular website. These ads are image-based, rather than text-based and a popular form of website advertising. They are very simple pieces of HTML code (they can be a simple image or active), but their presence is immense on the web, and to an internet business on the web. Who can create a banner? Anyone with a computer and internet access. Who looks at the material? Any one on the internet. A: attention-the ad may pop up depending on what is typed into the search field. I: Interest- you may already be interested in the item and you will search further. D: Desire? Maybe…depends on what you are looking for and price. A: Action-Maybe? Depends on interest and the price. For Kent’s Camera Castle, depending on the age of the potential customer, many older adults prefer to go in and look at the item, and they may or may not be on the internet, but this will serve the younger market. An effective message would be short and to the point, because if you are already on the web, you have an idea of what you want. I would use the display ad using the name of the camera, three beneficial features, and one tag line. I was surprised that yes, it is easy to create your banner, but you must also find a person to publish it or exhibit the banner for you. I felt with all the social media, one of those would work. The first banner ad was created by AT&T, on October 27, 1994 and even has its own .com address! How Does Trust Building Relate to Wabasha’s Eagle Center? 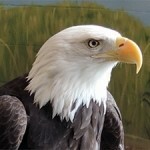 This past Saturday, my daughter Shaynan and I drove to Wabasha to visit the Eagle Center. While most people have attended this facility, it has been on my list for the last five years, ever since I happened to view a news report about Angel and her visit to the river, in winter, to revisit what was her daily routine, when she was not injured and no longer able to live in the wild. She allowed the handler to pick her up and walk down to the water’s edge and place her feet in the water and splash around for a time. Angel may have been tethered to a bar, and humans standing nearby, but for a moment there it looked like she was reliving a past pleasure. Sigh! I think Angel just sighed, she is remembering her life as it was before! The eagles located at the Eagle Center have been injured and are no longer able to live in the wild. Most injuries are from being struck by a car and either a leg is damaged or a wing is broken and cannot be healed. They may be injured but their job now is to educate the public and raise awareness about these majestic animals. As part as admission, you may attend a presentation where a handler discusses eagles, their diet, how far they can see and how wide the wing span is. In addition, the handler discusses the fact that while it may look easy to you and you may think all you have to do is walk up there and stick your arm out and the eagle or hawk will just jump on, that is not the case. In each situation, trust needs to be earned as this is truly a wild animal, from feeding to letting the bird perch on your leather-glove arm. In each talon, there is 400 psi of pressure, and if there are four talons at the end of each foot, that is a lot of trust you are putting on that bird to not crush your arm! In addition, these birds are not raised in captivity and while they are handled on a daily basis, they still need to trust you, and not harm you, and they expect the same from you. Each handler feeds and cares for their assigned bird and a relationship is formed. I have great admiration for these workers because they assume a great deal of responsibility for the care of a fragile animal and one bad memory may make that eagle not trust again. Trust takes time and patience, whether you are human or not. We each place our trust in others and want to be treated the way we treat the other. Life is too short to put your trust in the wrong person. Enjoy life, but make sure that each moment is the best possible moment out there.